Pint and Kram stood together under a blanket, which was blue (but to my camera appeared gray from lag), and Redtail continued, “The Bride and Groom wear blue blankets over their shoulders a traditional symbol of their Old Ways - the single life. ... Sacred Fire, Fire of inspirations, Fire of transformation. Oh Sacred fire, burn within these two blessed loved ones. May their lives together be as long and eternal as your flame. Tunkasila, Great Grandfather, we thank you for the gift of this day. Pilamaya yelo. Ah'Ho!” Pint, Kram, and several in the crowd responded “Aho” in turn. Redtail continued, “The sister, gives the gifts to the wedding couple. The bride and groom exchange these gifts. This shows the marriage is acceptable by the family. The brother, gives the gifts to the wedding couple. The bride and groom exchange these gifts also. 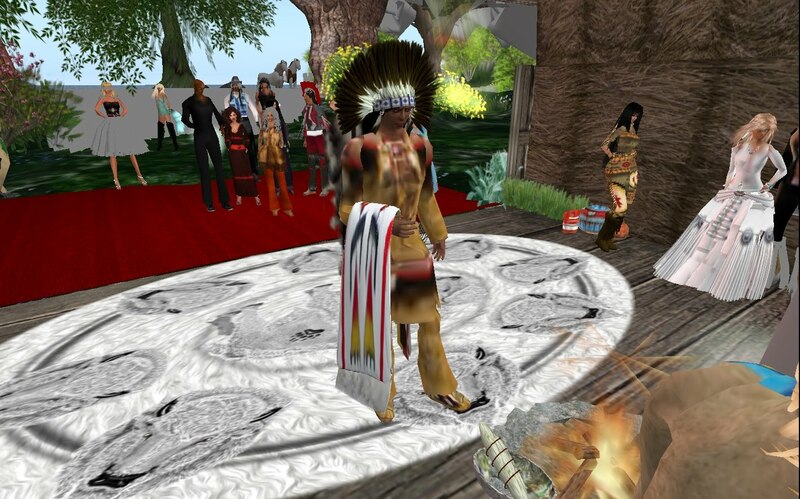 This shows the marriage is acceptable by the family.” The gifts appeared before the couple, Kram saying, “Thank you.” Redtail, “The bride and groom now in their blankets, symbolizing mutual support. Bride and Groom will now say their vows to each other. 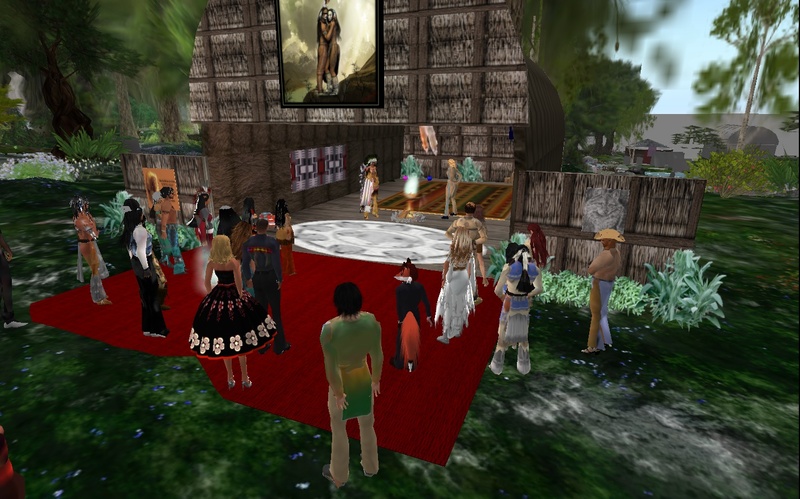 Groom first.” And the couple spoke their vows, interrupted by one lady avatar’s virtual pregnancy emote. “It is done. Ah'Ho!” And with Redtail concluding the ceremony, several did some “yip-yip-yip” emotes, as well as others saying, “ah’ho” in turn. People began congratulating the couple, wishing them well. Following the ceremony, there was a reception at Club Shiraz, with Rae Delicioso as the live entertainment. Pint Hoyes is a club hostess in Second Life, working at the Queen of Hearts riverboat club at Mystery. AWESOME! I was there! It was a very special ceremony of two very nice, sweet people! I have never been to a weeding like this before and it was spectacular! An online reporter, covering the news large and small in Second Life, the people, the places, and the events.